In keeping with our motto, we’re here to help you have it ALL! We are continuing our new feature, “IT TAKES A VILLAGE” on our blog so that you hear from other talented friends with MORE ideas to help you have it ALL. Meet Francine. 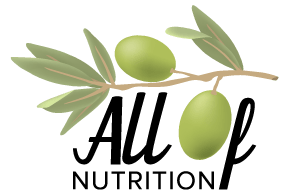 We met as featured health professionals at Nutrition Simply. Nutrition Simply believes wellness shouldn’t have to be complicated and being healthy should be doable, even fun!!! Whether we’d like to admit it or not, colder weather is just around the corner. From my experience as a trainer and working out on my own, I’ve seen cold temperatures put a damper on regular workout schedules. It can be difficult to fight the urge to not work out during the winter months, but keeping your regular routine going can help you beat the winter blues and stay positive. Plus, you’ll feel better about yourself and your fitness level by the time Spring rolls around again. So, what advice would I give you to stay fit this winter? Here are my 7 simple tips to help you stay fit this winter. Utilize what the season brings by finding new ways to work out. This can include anything from winter hikes, joining an outdoor running group or brisk mid-day walks. If being outdoors really isn’t your thing, you may want to invest in a few studio classes while it’s cold outside or set up a workout area at home. Try a new class that may not be your normal type of class, add weights to routine if you don’t already use them or learn to use a new machine. By mixing it up and finding a type of exercise you really enjoy, you’re more likely to stay motivated through the season. Decide on a budget ahead of time, and stick with items that fall within the ‘medium’ range. Selecting workout gear that is cheaply made can leave you with poor results, but it’s not always necessary to spend top dollar on clothes you’ll only be wearing for a few months at a time. Don’t be afraid to do your research on mid-range gear. Look for clothing with thermal material, specifically designed for cold weather and/or clothing with the ability to be layered. For layering, think sweat-wicking and materials that help retain heat. 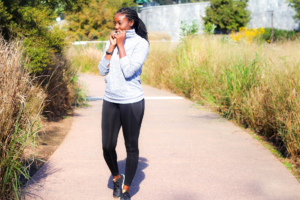 Compression Thermal Tights: My go-to winter pants are Athleta’s Polartec® Sculptek Tights. Why do I love them so much? They are perfect for just about any outdoor activity you can think of; running, HIIT, hiking, walking and so much more. They are ultra-comfy, have compression fabric through the waist (hint, hint – in all areas right where you need and want it), sweat-wicking so your sweat is pulled away from your body and have several pockets built in to help you take on any activity. Pullover Sweater: I’m a big fan of pullover sweaters for winter weather because they can be worn during outdoor activities or quickly pulled on after sweating it out during indoor activities. My go-to pullover is Old Navy’s Funnel-Neck Pullover Hoodie. The fabric is cozy, retains heat to keep you warm, the long sleeves have thumb holes (perfect for keeping your hands warm but keeping your fingertips free) and there are good size pockets in front to help carry your phone, keys and/or wallet. As you might imagine, it can be hard to stay motivated in the winter. One of the best ways to keep on track is to set a specific goal for yourself. Maybe you want to tone or lose a few pounds by the new year. Maybe you want to cut some time off your mile pace, or lift a certain amount of weight, etc. As the end of the year approaches, there is no better time to set a goal for yourself. If you stick with it, you’ll be able to ring in the New Year knowing you’ve achieved something great! One great way to stay motivated during these dark and dreary months is to work out with a friend! This is a great motivational tool year-round, but can become almost invaluable during the winter. They can hold you accountable for your regular workouts, and make the entire experience far more enjoyable. Whether you already have a friend you like to work out with, or you need to invest in a personal trainer to keep you motivated for a few months, it’s worth it to not have to fly solo in the cold. A second option is to sign-up for in-studio classes to connect with others. You can take classes together and keep each other accountable. If finding a local buddy isn’t possible, think about purchasing a wearable fitness device, like a Fitbit. You can connect and workout with friends locally or people all over the world. You can purchase a new or used device depending on your budget. For many of us, winter tends to be a busy time of year. The holidays take over, we spend more time with family and friends, and on top of it all? The days are shorter. It can be overwhelming to feel as though you have to get your ‘standard’ workout in each day. While you don’t have to loosen the reigns on your workout routine in the winter, it is important not to push yourself too much. This can lead you to the point where working out becomes a chore, or a burden. That will leave you feeling overwhelmed an unmotivated. Aside from finding a workout you actually enjoy doing, make sure you’re adapting your routine to fit your winter schedule, as well. You don’t necessarily have to work out for hours in order to see results. Focus on choosing shorter, more effective workouts that combine strength and cardio. If it’s freezing outside, these kinds of workouts can be incredibly helpful. You may also find you get better results than doing the same repetitive routines over and over again. If you’ve never tried a HIIT or Tabata-style routine before, it’s a great time to start. They are usually shorter, but work your entire body quickly and effectively. Here are a few of my go-to workouts. Check out the list, find what works for you and go for it! You already know the importance of fueling your body for a workout, and for overall fitness. But, the way you fuel up might have to change in the winter, depending on the type of exercising you’re doing. Your body needs to stay warm to help you combat the chilly temperatures. If you find yourself exercising outside and frequently getting hungry, it’s a sure sign that your body is burning up that fuel just to stay warm, and you’re probably not getting the nutrition you need to fuel your workout properly. It’s essential to stay hydrated in the winter. You may not feel like you’re sweating much, but your body needs just as much (if not more water) to function properly. The best foods you can eat that burn quickly, give you energy, and fuel your workout include things like oatmeal, whole wheat bread, and bananas. You should never work out on an empty stomach in the winter, so experiment with what foods work best for you. THE KNOCKOUT METHOD encourages you to add a little protein to your workout fuel. Keeping a regular workout routine throughout the winter can be hard but it’s great way to stay positive, feel motivated, and beat seasonal sadness. Keep these 7 tips in mind to make your workouts through the winter something you look forward to each day.